Leema Creations (Pvt.) Ltd, the leading total interior service provider and furniture manufacturer, won the Silver award for the Large Category segment at Entrepreneur of the Year Award 2017, organised annually by the Federation of Chambers of Commerce and Industry. This award ceremony, organised for the 22nd consecutive year, was held at the BMICH under the patronage of President Maithripala Sirisena along with the participation of the Ministers Rishad Bathiudeen, Daya Gamage, Malik Samarawikrama, entrepreneurs and dignitaries. The award was received by Leema Creations Managing Director Channa Wijesekara, who is recognized as a pioneer in the field of wood-related industry with experience of over 35 years. The management of Leema Creations gives priority to provide training to all categories of staff both internally and externally to update and improve their skills, which enables them to provide the best services, products to the client with workmanship of the highest possible standards. Leema Creations being ISO certified, the staff is constantly trained to conform to ISO standards, procedures and processes. Combined with the skilled workforce and availability of a modern large manufacturing plant with the latest state-of-the-art sophisticated computerized machinery, Leema Creations is synonymous with technical expertise which enables it to turnout the highest quality furniture products with precise finishes. 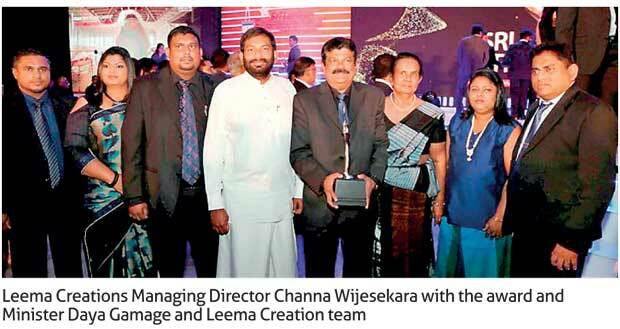 In recognition, Leema Creations has throughout the years continuously won many prestigious awards from all leading trade chambers of Sri Lanka including the prestigious Brand Excellence in Interior Decorators and Designers Award for the SAARC region 2017, at the South Asian Partnership Summit and Business Awards ceremony held in October 2017 in Bangladesh.